Hillary Clinton laid out part of her agenda to combat climate change on Sunday, calling for a sharp increase in the use of solar energy and other green energy sources with the stated goal of powering every home in America with renewable energy by 2027. It was an ambitious benchmark, and it drew swift praise from some prominent environmental groups who welcomed Clinton's push for carbon-neutral fuels. But others were more concerned about what Clinton left out - and it was quite a list, if you ask them. ""Clinton's climate plan is remarkable for what it [doesn't] say, yet," declared Climate Hawks Vote, an environmental advocacy group, in a statement. "No effort to keep fossil fuels in the ground, no price on carbon; no word on Keystone XL, Arctic oil, or other carbon bombs; no word on fracking; no call for adaptation." "Hillary Clinton is just half the way there," added Bill McKibben, who's helped lead the push for President Obama to reject the Keystone XL oil pipeline as the head of a group called 350.org. "This is a credible commitment to renewable energy, and a recognition that the economics of electricity are changing fast. Now, we need Clinton to show she understands the other half of the climate change equation -- and prove she has the courage to stand up against fossil fuel projects like offshore and Arctic drilling, coal leasing in the Powder River basin, and the Keystone XL pipeline. "At the end of the day, growth in renewables doesn't mean enough if we're simultaneously kicking the decarbonization can down the road with more pipelines and more extraction on public lands," McKibben added. Indeed, Clinton did not weigh in on issues like offshore drilling and hydraulic fracturing, both techniques used to extract the carbon-based fuels that scientists blame for global warming. She did not mention a cap-and-trade system or other device to put a tax on carbon emissions, which many environmentalists see as the most significant step the government could take to promote renewable energy. And she again declined to weigh in on whether the government should approve the Keystone XL oil pipeline, which would carry crude oil from Canadian tar sands to refineries along the U.S. Gulf Coast, suggesting her role in assessing the project as Secretary of State precludes her from commenting on the final decision. "The evaluation is to determine whether this pipeline is in this nation's interest and I'm confident that the pipeline's impact on greenhouse gas emissions will be a major factor," Clinton said Sunday. "I will refrain from commenting because I had a leading role in getting that process started and I think that we have to let it run its course." It was a demurral she'd offered before, and one that hasn't gone unnoticed by Clinton's Democratic primary foes. "Real leadership is about forging public opinion on issues like Keystone -- not following it," said Lis Smith, the deputy campaign manager for former Maryland Gov. Martin O'Malley. "Every Democrat should follow his lead and take a stand to commit to ending our reliance on fossil fuels." After Clinton's event Sunday, the O'Malley campaign highlighted the former governor's own plan to combat climate change in a memorandum titled "What Real Climate Leadership Looks Like." And in an email to supporters, O'Malley reiterated his own goals - to completely transition to renewable fuels by 2050, to double energy efficiency within 15 years, and to create a "clean energy jobs corp to rebuild, retrofit, and restore our communities and our environment." Clinton's campaign has emphasized that Monday's proposals were only the first plank of a more comprehensive platform on environmental issues, suggesting she'll offer more detail on energy policy as the campaign goes on. And even her first campaign foray into the issue earned plenty of unequivocal praise. "We are thrilled to hear Sen. Clinton's full support for the Clean Power Plan, and her plans to go well beyond it," said the Sierra Club in a statement. "Americans want climate action and strongly prefer clean energy over fossil fuels. 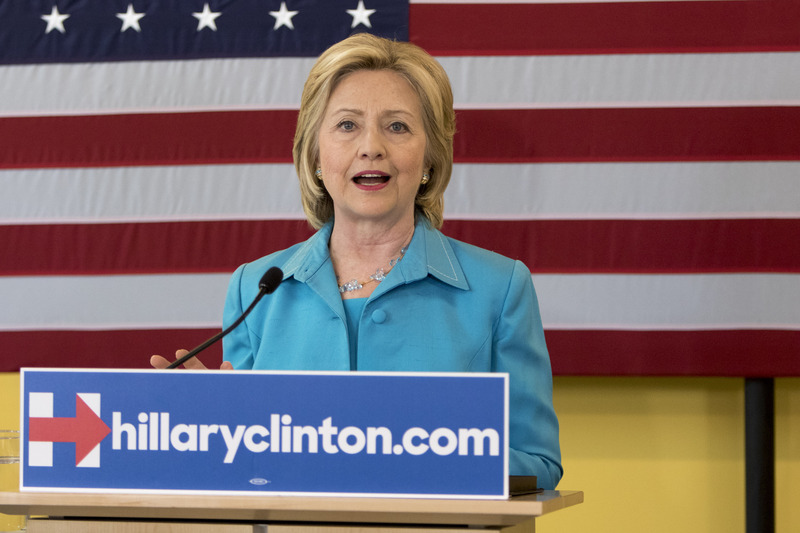 We're pleased that Sen. Clinton has taken note by prioritizing clean energy growth." And billionaire Tom Steyer, who has promised an aggressive investment in political candidates that support clean energy solutions, said the "ambitious framework" Clinton outlined positioned her as a "strong leader in solving the climate crisis." Perhaps mindful of the lingering skepticism among some activists, though, Clinton urged people to stay tuned as she continues rolling out her energy platform. "I am going to set ambitious goals," she promised, "and I am going to have a real plan that will enable us to meet those goals."